Saturday April 20: Dinner/Auction at Indian Creek Farmstead 5:30 pm. Tickets for are $30 in advance for music, dinner, and the silent and live auctions. Contact Diane at 413-1820 or Kathy at 341-0757 for tickets. Mark your calendars. Plans are under way for the 2019 Marbold Farmstead Antique Show and Farm Fest, June 22nd 9am to 8pm and June 23rd 9am to 3pm. We have six antique dealers so far. We will have craftsmen demonstrating, vintage tractors on display, civil war group, flea market on Sunday, history & tours, food, music and more! A rain or shine event for a small admission is charged. For details about Work Days click Here. First Baptist Church, Rt. 29, Greenview, 6 p.m. The 2018 Fall Arts and Crafts Festival was held September 29th. Thanks to everyone who came out to the Fall Arts and Crafts Festival. It was great to have that opportunity to share the history of the Marbold Farmstead with all of you. We hope you enjoyed it and hope to see you again next year. And congratulations to all the door prize winners and the winner of the school art contests. The 2018 Antique Show & Farm Fest was held June 23rd 9am to 8pm and June 24th 9am to 3pm. Thanks to everyone who came out to the Antique Show and Farm Fest. We hope you enjoyed yourselves and learned some history along the way. Whether about Marbold Farmstead itself or what it was like to be a woman or a soldier during the Civil War. Farm Day May 11th, 2018. 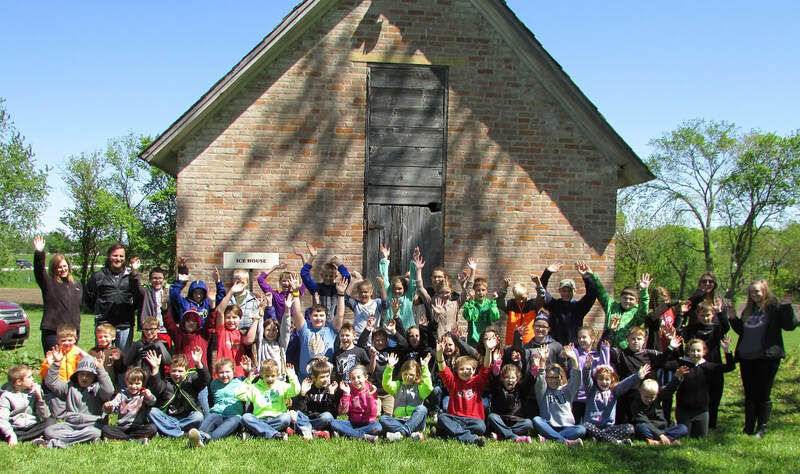 Students from the Greenview schools came out for the day to learn about the history of Marbold Farmstead and what life was like on the farm in the late 1800s. Marbold Farmstead Annual Meeting. was held Friday, January 12, 2018, 6:15 PM, at First Baptist Church in Greenview (south edge of town). A catered dinner was enjoyed from Hamilton's. Following dinner Jerome Johnson of the Garfield Farm Museum in LaFox, IL spoke about his experience as director of that site. A business meeting followed including the financial report, president's report and information about our future plans. Election of directors was also held. Door prizes were awarded at the conclusion of the evening. For more information about the Garfield Farm Museum go to www.garfield.org . For photos Click Here. The Fall Arts and Crafts Festival was held Saturday Sept. 30th, 2017 9am to 4pm. Arts and crafts sales and demonstrations. 26 vendors in all. The Greenview Student art exhibit and contest results were presented. Music was provided by the Wildwood Strings dulcimer group, Peaches & Bacon bluegrass group, and the Menard County singers. Great Food was provided by Bud’s Smokehouse BBQ of Petersburg. Anthony’s “Big Lemon” served lemon shake-ups. Shelly Denton was back with her delicious Kettle Corn. Cake provided by volunteers was served along with ice cream. We all had a great day at Marbold Farmstead. Thanks to everyone that came out and spent the day with us. And THANK YOU to the vendors and volunteers that made the day special. To View photos of this event Click Here. Tours were held September 17th, 2017. Tours of the farmstead when conducted September 3rd and 4th, 2017 in conjunction with the 39th Annual Greenview Labor Day celebration. Tours were held August 6th and 20th, 2017. About 12 people came out to learn about the history of the farmstead. 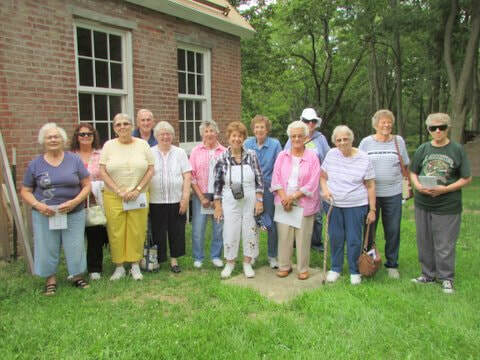 Charlotte Wohler gave a tour of the farmstead on Tuesday, Aug. 1st to the Fondulac Park District group, from East Peoria. Thirteen lovely people listened to the Marbold history and toured the house. ​We had 12 people come out and tour the house and grounds. We hope they enjoyed the history about the Farmstead presented. One visitor placed membership with the Association. Several others gave donations. Thank You. 2017 Marbold Antique Show & Farm Fest. The antique show and farm fest held during the weekend of June 23-25 was attended by over 600 visitors! Guests where able to shop for antiques, see craftsman at work, watch a small scale steam engine, make string and see how a baler works among other things. On display in the barnyard was vintage ag tractors, a 1915 Case Steam Engine Tractor and gas engines. Visitors were able to enjoy music, historic portrayals, Civil War Infantry soldiers, watch local actors perform One Grand Old Lady, great food and much more! See photos on our website as well as this newsletter! This is HMFA’s largest fundraiser. Thanks to everyone who attended and enjoyed the wide variety of activities at the Farmstead! To view the detail of the 2017 event Click Here. To view photos of it Click Here. We held a Quilt and Afghan Raffle In conjunction with the 2017 Antique Show & Farm Fest..
2017 Farm Day was held at the Farmstead Friday, May 5th. Second graders, fourth graders & fifth graders participated from Greenview Elementary. Fifth graders had classroom instruction about surveying and were then able to use their skills at the farmstead. The young people were able to make butter, grind coffee, use an old apple peeler, grind corn, shell corn, learn about items that would have been used during the day (chamber pot, pillow fluffer, foot warmer), and more. Learning 'stations' were in the parlor, west bedroom, kitchen, wash house & smokehouse and a walking tour of the grounds. Forty-five students participated, along with four teachers and one parent. Thank you to the Greenview Elementary teachers and Supt. Ryan Heavner for participating in Farm Day. Thanks to the high school student that took the pictures for us. And a big thank you to our volunteers, especially Bob Church, for his expertise with the surveying. Our mission of educating the current generation was achieved this day. Click here for the photo Album. Marbold Antique & Collectible 50/50 Auction was held Sunday, April 23, 2017 @ 11:00 a.m.
Sanert Auction Center, Greenview, IL. We would like to thank everyone that donated items and everyone that attended. The 50/50 Auction allowed participants to give 50% or 100% of the proceeds of their donated item to the Historic Marbold Farmstead Association. All proceeds will be used to restore and rebuild the farmstead. The 2017 Annual Membership Meeting & Five Year Celebration was held at the First Baptist Church in Greenview, March 25, 2017 at 7 p.m. The evening featured speaker Frank Butterfield of Landmarks Illinois, a power point presentation, a business meeting, and recognitions of our Founders, members, past board members and those community and area citizens who have helped save the farmstead. The Marbold Farmstead Association signed the deed to the property on March 27, 2012. Along with our annual meeting we celebrated our accomplishments and shared our progress and goals. Check out the pictures in this photo album. Ticket and silent auction proceeds go toward renovation of the 1850 farmstead. Food provided by Cooper's StrEATside Bistro and also included pie and homemade ice cream. On Saturday, June 25, the Farmstead greeted guests as HMFA hosted exceptional antique dealers selling unique country primitives. More than 20 dealers displayed and sold their wares in the house and in tents located on the south lawn. Period craftsmen were also on site demonstrating and educating guests about their unique skills. A basket maker, a spinner/weaver, a potter, and a soap maker were just a few of the craftsmen who were on site. Tours of the Farmstead were available, and guests learned the history of the farm and the Marbold family. Sandwiches, drinks, and sweets were available throughout the day. The profits from this largest HMFA fundraiser of the year will be used to restore and rebuild the Farmstead. On Friday, May 6, Greenview elementary students had the opportunity to experience something unique and different from their daily lives. Second, fourth, and fifth graders stepped back in time, through hands-on learning opportunities, to understand what farming and farm life was like. They heard the history of the Farmstead, witnessed and assisted in the process of making butter, heard about immigration, saw household items that were once a part of a home in the late 1800s, and visited the barn site and grounds. Fun and games were also included in their visit. On Wednesday, May 4, and Thursday, May 5, the fifth grade class was presented a surveying curriculum explaining and demonstrating surveying as it was during Abraham Lincoln's years as a surveyor. The lessons were presented by Robert Church and assisted by Susan Wilson. Culminating on Friday, May 6, students applied their newly acquired skills at the Farmstead where they plotted a piece of land using historical equipment.